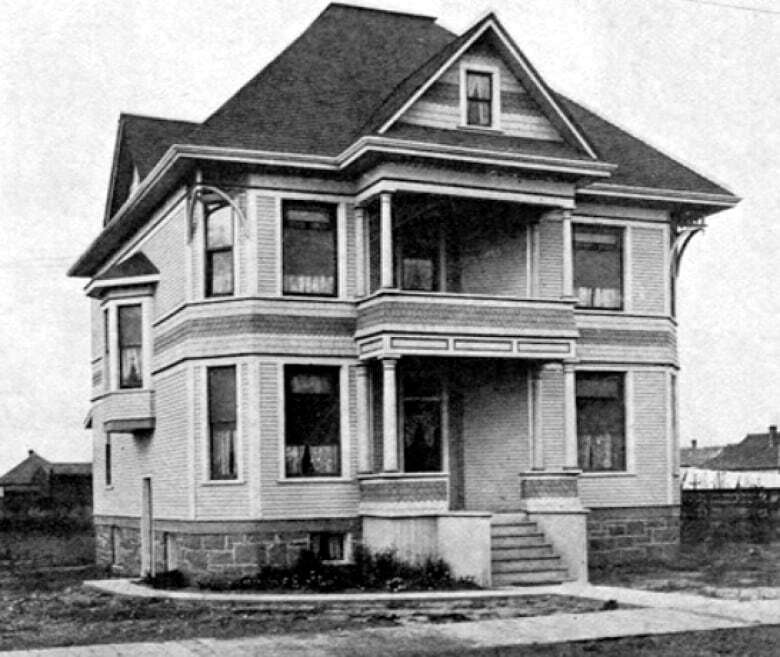 Built in 1904 by Enoch Samuel Sales, the house is now owned by the Calgary Municipal Land Corporation and has been boarded up for several years. The historic Enoch Sales House in Calgary's Victoria Park neighbourhood went up in flames early Saturday. Fire crews were called in at about 7 a.m. as flames and heavy smoke billowed from the building. "They declared a working fire on arrival and shortly after that a second alarm was struck," said Capt. Paul Frederick. "Due to the extreme temperatures extra apparatus were called to make sure we had enough to rotate the crews." The temperature outside at the time was about -17 C.
Firefighters didn't enter the building because of its derelict condition, said Frederick. Coun. Evan Woolley, who has advocated for preserving the building for several years, called the loss monumental. "This is the last Victorian mansion … in the neighbourhood, it had significant heritage value and it's disappointing to see the loss of this building," he said. "In 2015, CMLC conducted a thorough assessment of the house to examine options and associated costs to rehabilitate the house and relocate to Enoch Park. The cost estimate for the restoration and relocation was approximately $3 million," said CMLC president Michael Brown in an emailed statement. "Since CMLC's acquisition of the house in April 2017, annual structural assessments have been undertaken to determine the general condition of the building structure and undertake any temporary measures to ensure the safety and integrity of the building. "These assessments were completed in February 2017 and July 2018. "While approvals and funding were not yet in place to determine the long-term plans for the Enoch Sales House, CMLC was committed to ensuring the building's integrity over the past two years." Woolley said he will ask administrators at Monday's council meeting why plans for the house hadn't been finalized yet. "I know efforts had been underway and recommendations from the CMLC to the board to save the building, and as far as I know those recommendations weren't passed," he said. "We'll be looking for clarity around what exactly happened." The big yellow house on 12th Avenue near Macleod Trail S.E. is one of the last pre-First World War homes in the area. Sales was the owner of the Sales Clothing Company and lived in the house until he passed away in 1930 at age 71. "It is a two-storey, square plan, wood-frame building faced in bevelled wood siding. It has a prominent two-tier, central front porch, and a steep hip roof with cap and with lower cross gables," reads a statement from Josh Traptow, executive director of the Calgary Heritage Authority. "The Sales Residence is a singular surviving example of the substantial and stylish homes built in the earliest years of Victoria Park for managerial and merchant classes. "It represents a period when Victoria Park developed as an upscale and desirable residential neighbourhood at the end of the nineteenth century and earliest years of the twentieth century, prior to the area's transition to a working class community." The home is an early, rare, and intact example of the 'Free Classic' Queen Anne Revival style in Calgary. There is no word yet on the cause of the fire.